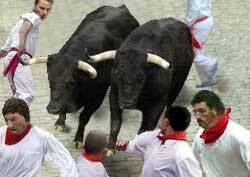 The internationally famous running of the bulls event takes place in Pamplona annually in July. Six top-selected fighting bulls are stampeded through the Pamplona streets to reach the bullring, where they will engage matadors later in the afternoon. It normally takes the bulls several minutes to travel the 850 meters (900 yards) long course to the bullring. It can take much longer if a bull slips and disrupts the smooth flow of the rushing animals. Young men (and occasionally women) don traditional white outfits accessorized with red sashes and scarfs. They race in front of the bulls to show off (or prove something to themselves) in a display of bravado. See photo. They are at the start (Cuesta de San Domingo) and end (close to the bullring) of the running. To secure a good vantage, you have to occupy it two or three hours before the bulls dart out of the holding pen. Alternatively, you can buy a ticket for reserved seating or standing. Since 1924, 13 runners have been killed and scores have been injured. Some people want the running outlawed for that reason. Others say that the event serves its purpose.